The Braille wristband is an exclusive, made-to- order accessory for the visually impaired community that can represent the wearer’s creativity and style. Customize any wristband with your personalized custom message. 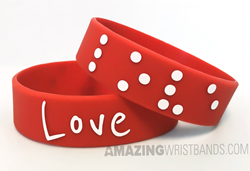 The Braille wristband is an exclusive, made-to-order accessory that can represent the individual’s creativity and style. Amazing Wristbands, a leading provider of customized silicone wristband bracelets, takes great pride in its continuous efforts to create custom Braille wristbands for the visually impaired community. Four years ago this month, Amazing Wristbands created their first Braille wristband for a special customer. They continue to create not only custom Braille wristbands but other custom silicone Braille products. The Braille wristband is an exclusive, made-to-order accessory that can represent the individual’s creativity and style. This unique wristband offers a chance to collaborate with charities and provide help for the visually impaired community. Messages are 100% customizable and are embossed which gives a raised message that stands out to the touch.